Some folks are scared off by the costs associated with the equipment but in many cases, their fears are misguided. 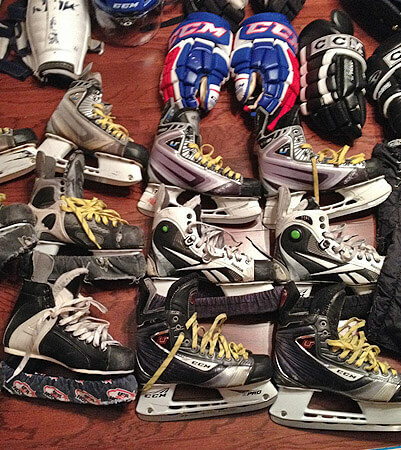 Hockey, on it's own, is expensive and the equipment, well, is actually a bargain of sorts. For my kids to play youth soccer, the registration fee is $50 each and they get a jersey and a ball as part of the deal. For hockey, registration alone is just shy of a grand. Each. And that's for the under-5 crowd -- the prices go up almost exponentially as they age. Oh, and there's no uniform included. The registration costs are essentially just for ice time. So, with that in mind, is spending $25 - $30 on a new pair of shoulder pads really cost prohibitive? I don't think so. But I will say, there's nothing wrong with buying used shin guards, pants, shoulder pads, elbow pads, and, yes, skates too. 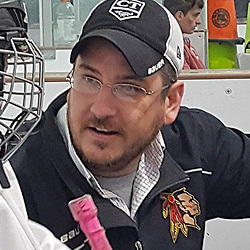 Many parents think used skates are a big no-no thinking that the skates are the most important piece of equipment for a hockey player. It's true that skating is 80% of the game and that your child's skates should fit properly. But that doesn't mean you need to go out and purchase the lastest "bake-able" blades out there. Fact is, even today, new skates need to be broken in even when they're custom molded to your feet. I remember as a kid having horrible blisters on the sides of my heels following that first practice. I'm cringing right now just thinking about it. Oh man, that huge piece of skin missing where a band-aid will never ever stay put. Two of my kids wear second hand skates on the ice. Neither pair was in rough shape when we picked them up but they weren't super stiff either. My middle son has been in the same pair for nearly a year now and, let me tell you, those things fit like a pair of slippers. Easy on, easy off. Nice and tight but comfortable too. He's never once had a blister. And let's get real, there is little competitive difference to be had for a youth hockey player when comparing used $20 skates and new $120 skates. Pre-broken in skates are more comfortable and make the game more fun. Save the $800+ skates for when their feet stop growing. Now, there are two pieces of equipment that I do think you should always buy new -- gloves and helmets. My oldest son, Duncan, has been wearing the same pair of gloves for about two years now -- since he was about three-and-a-half and just getting the hang of skating -- and, let me tell you, those things could knock you out cold. It's like a combination of vinegar, ammonia, road kill, with a faint aroma of an old dryer sheet trying to push to the surface. Point is, gloves stink. They're the first piece of equipment to get really gross -- even for a 5-year old. Don't put your kid's hands in someone else's stank. I'll confess that my middle son, Henrik, currently wears a used helmet but once he outgrows it, he'll be getting a brand new one. Helmets are tough because they're so expensive and, with little kids, sometimes they just don't fit correctly. So hard to buy online because of the fit and so hard to find at a local pro shop because very few stock sizes so small. Sometimes it's the helmet and cage combo that just don't work. Henrik originally had a CCM helmet that fit his head perfectly but the cage attached to it came out so far that his chin was a good 3-inches away from the chin cup. No matter the adjustments we made, the helmet was never really secure on his head so, in a rush, we bought a used Bauer helmet -- just like Duncan's -- that did line up just right with the circumference and depth of his head. So, while I don't think used helmets are the worst thing in the world, don't settle with one just because it's cheap. Find one that fits correctly -- it's important. And totally worth any additional expense. For used equipment, eBay is a treasure trove if it's something you don't need to try on. And most pro shops also sell used equipment so making semi-routine visits to places like Play-It Again can reap rewards.